A month travelling around Europe. We choose spring as the perfect time to travel with Eurail Pass, to try one of the most traditional ways to explore Europe. After 17 trains trips, we figured out some truths and understood why some people love Eurail Passes, and why others not that much. So we decided to put some information together to help you decided if it is worth or not to travel with Eurail Pass. There are many options of Eurail Passes and we are going to talk about them later. First I want to point out that we travelled with a Eurail Global Pass 1st class. It means that we could take as many trains as we wanted in whole Europe [28 countries included], during a period of 30 days. The first class wasn´t an essential thing for us, but as we are over 26 years [don’t tell this to anyone else, ok!] we can only get Eurail Pass 1st class. However, on the end of the trip I was glad with this compulsory issue, it made the journey much more comfortable. This was our first experience travelling with long distance trains and Eurail Pass. And after 17 trains trips we decide to put some questions on the table to help you understand the good and the bad aspects of travel with Eurail pass. Yes, it is! Definitely one of the easiest ways of traveling around Europe! The idea of only one ticket, many connections, and an overwhelming option of timetable is what I call an easy way of travelling. We took 17 trains, we crossed 7 countries, an endless amount of cities, villages… and believe or not, we had no problem. When we started our journey I wasn’t convinced by the label “easy way of travelling”, but turned out to be an extremely smooth experience. Why? First of all, you don’t need to do check-in, you can arrive at the station just 20 – 30 minutes in advance, you don’t need to pass by X-ray, passport control, either drop your luggage over the counter [unless you are travelling from France to UK]. You just arrive, find your train, your seat and relax. Before the first trip, you will need to validate the pass at the train station ticket window, after that you don’t need to worry about anything else. The crew from the train will approach you during the journey just to check the pass and passport, no further questions, nothing. Even to cross the country’s borders was easy, only in Spain and Switzerland the immigration officer questioned about our travels plans. Another easy aspect is that most of the train stations are located in the city center and are well-connected with public transportation, what makes super easy to get in and out of the places. Yes, especially if you have an open plan and will travel for a long period! For us, the Eurail Pass was perfect. We knew beforehand the cities and countries we want to visit, and the average of days we would spend there. So we didn’t need to book anything in advance, we just search for the best route and the timetable to organize our departure and arrival time. Also, if you miss a train [what happened with us after a long night partying in Paris] we just waited for next one, no changing of bookings, no changing tickets, nothing. One important fact about flexibility: local and regional trains run almost every hour, so it’s easy to catch the next one and keep moving. However, the high-speed trains and border connection are not so often. To make our travel planning easy, we downloaded the Eurail App in my mobile so we could search the connections, timetables and type of trains in a simple click. The app work offline what is great! I would say that travel with Eurail Pass is far more flexible than travel by bus and flights. It takes more time as you are going to spend few hours travelling and looking at stunning landscapes, but it is hassle free. After one month, travelling by train in Europe was difficult to go back to the low-cost airlines restrictions. If you are going to travel just in one or 2 countries, it is easy, you can use the route planner on the Eurail website and you will find the timetables and best options for you. Although if you are going to travel long distances and reach many different countries, things get a little bit more complicated and trick. The Eurail Pass covers all Europe, from Portugal to Turkey, going up to Sweden and even Ireland is on the map, but not all the train services are included freely on the passes. This is why many people say it is not worth to travel with Eurail Pass because sometimes you may need to make reservations and even pay some extra fees. About the fees we are going to talk in the next topic, first I want to focus on choosing the itinerary. We travelled over a month without doing any reservation and without paying any extra fee. How? We choose to travel only with local and regional trains. On the Eurail App there is a function to search only those types of trains, excluding the ones that need a reservation. So you only need to show up in the station and walk in the train. Of course, the trips are longer and sometimes you will need to do several connections between point A and B, but this is the adventure of travelling. We started our trip in Milan and our first destination was Paris. But before arriving in the French capital we passed by Bellinzona [IT], Basel [CH], Mulhouse [FR], Belfort [FR] and then Paris. A journey of 12 hours with amazing views from the north of Italy, Swiss Alps, French countryside. A few stops for coffee, snacks and some running between platforms to catch the next train. If we did the same trip with a TGV high-speed and direct train it would take 7 hours, a faster option, but with some extra costs. When we moved from Paris to Amsterdam [and lost the first train because of my hangover, shame on me!] we choose local and regional trains again. Nine hours trip, 3 stops between cities and another great journey [as Rob told me, because I slept the whole trip]. Here is a good example of flexibility, because we missed the first train that was in our travel plan we had to do different connections, all then sorted out with our mobile app. Summing up, the itinerary is easy to organize, there are plenty of options if you don’t mind the long hours in the train and some waiting time at the stations. Although, if you prefer a straightforward trip in high-speed, you might have to deal with online reservations, previous booking and some additional fees. There are some fares and fees that are not included in the price of the Eurail Pass and you must have to consider them before buying the passes. All these fares are explained on the Eurail website and that´s why you have to read the contract carefully, and ask them some extra help in case you are in doubt. What are these fares and fees about? The high-speed train fare is not the same for all the countries too. In France and Italy [the most complicated countries for travelling with Eurail Pass on high-speed trains] you can only travel with TGV and Freccia with previous booking, and that will cost you some euros. For example, from Italy to France [by TGV] your extra fee will be from €48 – 80€ [1st class] or from €33 to €60 [2nd class]. Ouchh!!! You can check the list of fees here. However, in countries like Germany, Netherlands and Switzerland you can travel with high-speed without reservation. The only problem is if the first class is fully booked you might have to grab a seat on the 2nd class car. The German trains and service are amazing, first class with good WiFi, nice restaurants and even free candies! We travelled from Amsterdam to Berlin on the exactly day the German train workers went on a strike, even though we had no problem. With our Eurail Pass we just follow the instructions and the new timetable. During our month travelling with Eurail Pass we didn’t pay any extra fee or fare because we choose our itinerary based on local, regional and medium speed trains. We save some bucks while spending a few more hours on the trains. A deal that was positive for us, but maybe not for everybody. – 5º » So, Is it travel with Eurail Pass worth the money? This is the trickiest question ever, and our answer is: Yes and No! It is worth the money if you have time enough to search for the best connection, to enjoy the long distance rides, and if the train journey itself is part of your travel experience. Here we’ll be comparing the costs of 1 month Global Pass, so let´s go to our magic numbers! PS: We can´t calculate exactly the cost of a flight or a single train tickets because the price changes a lot. Sometimes you can get a great deal booking in advance, or a last-minute purchase can save you a couple of bucks. You never know. In this account we should also consider the expenses with transportation to/from the airports, plus the cost of the checked luggage. Here we did a simple calculation to help you think and decide if it is worth of not to invest and travel with Eurail Pass. If you want to get the real figures you might need to research deeper. Bottom line, if you look only to the figures, it is not cheap to travel with Eurail Pass. But if you think wisely it makes sense to buy the Global Pass if you are going for a long trip around Europe with no fixed plan. If you think of the costs for cancelling and remarking a flight ticket, or change dates and destinations in the last-minute, then for sure you will spend much more than the price of the Eurail Pass. That´s why you have to think clear about what type of experience you want during your Eurotrip! No doubt about it! There is no better way to see and experience Europe than travelling by train. Especially with Eurail Pass that gives you the flexibility to enjoy as much time as you want in each destination. Also you can take the local trains, passing by big cities, tiny villages and landscapes that you will make your trip memorable. I would say that travel with Eurail Pass is not about saving money, it is about the experience. Is about feeling like a local while changing trains and eating local food at the stations, is about meeting people on the seat next to you and learn different cultures, maybe even change your next destination because of this. The train trip was part of the whole travel experience. We were not focused on arriving in different places, but about the journey till there. 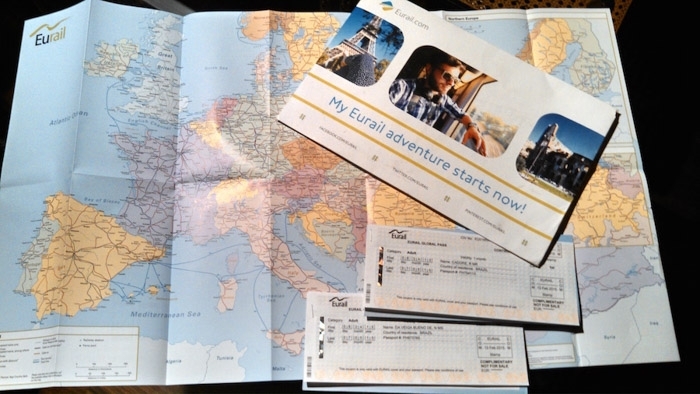 Travel with Eurail Pass worked perfectly, specially because we were prepared and we knew all the rules. We could never do the same trip with low-cost flights or last-minute trains. The Eurail Pass may be more expensive than other types of transportation but we think it’s a worthy experience. Our itinerary with Eurail Global Pass was: Italy » Switzerland » France » Belgium » Netherlands » Germany »Switzerland » France » Spain. Global Pass for 28 countries – you can buy for a short trip or up to 3 months, this last option is a pretty good deal. 4 / 2 or 1 Country Pass – you can choose the countries and how many days you want to spend travelling. All the passes have different prices with good reduction for students. For some countries [like Brazil] the delivery by post is free. Compare the all the passes, read the rules and buy the tickets straight from their website. I would also recommend you to follow them on Facebook for good deals and sales, there is always something going on there! Hope our 7 reasons why you should [or not] travel with Eurail Pass have helped you to plan your next train trip in Europe. If your route includes Spain, Portugal and Turkey keep reading the blog, we wrote many articles about the big cities and also some hidden gems. Or if you want to explore Eastern Europe, Sofia in Bulgaria can be a good call too. There are so many interesting destinations, beautiful cities, and amazing people to discover, that our next Eurotrip might be with a 3 months Eurail Pass [the longest pass they have and also the number of days our Schengen Visa allows 😉 ]. 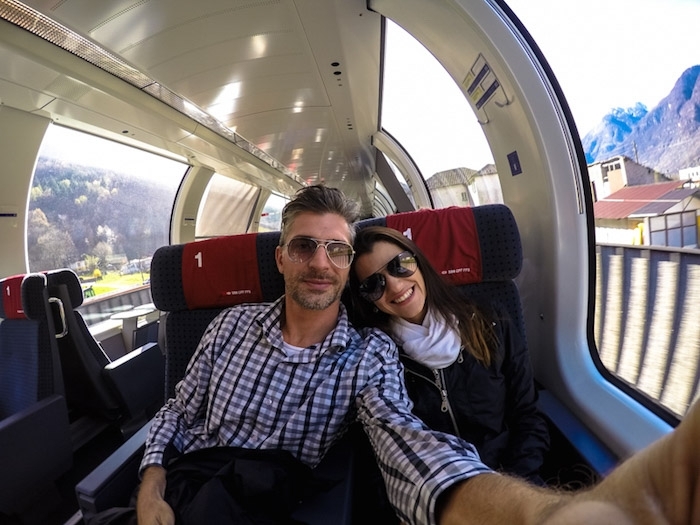 If you are European, our friends Ivana & Gianni from Nomad is Beautiful wrote a very useful guide on how to use Interrail. And you, would you travel by train around Europe? Did you travel with Eurail Pass? Share your experiences! PS 2: Our Global Passes were a courtesy from Eurail. However, doesn´t matter who paid the bill you always receive our truly opinion. Im sorry if this was mentioned in a previous comment, but if you dont mind me asking.. So you stayed in each places, were the hotels expensive? Im wanting to do some solo traveling and I want to see everything, but I won’t have a lot of money to stay at nice places, I was just wondering your budget after the Eurail global pass, or a rough estimate. Hope this will help you! Thanks for stopping by! I’m planning on backpacking across Europe May 2017 and I’m trying to plan now and budget everything so I know just how much to save up. I was planning on getting the Eurail Pass but was curious as to if it works with city subways as well as the regional and inter country trains. If you know if the pass works or doesn’t work, I’d really appreciate it! Thanks! For metro or buses, buy the weekly pass, or a booklet with 10 / 20 journeys. They are cheaper than the single tickets. We just got back from Germany (lower Baveria) and had a 7 Day Rail pass for Germany only. If those who are traveling by DB need a good app, DB also has a good app which can help you to plan your trip (even if you make changes long the way). The wifi on the train will remember you each time you get on a train that has wifi and automatically link to it through iPhone. The other thing that interesting is that we left out of Basel, Switzerland and it was one of the included stops which allowed us to leave without additional fees since it is so close to the border. Check DB for additional info though for yours. In addition, your Rail Pass will also offer discounts on city transportation, so take advantage of that! 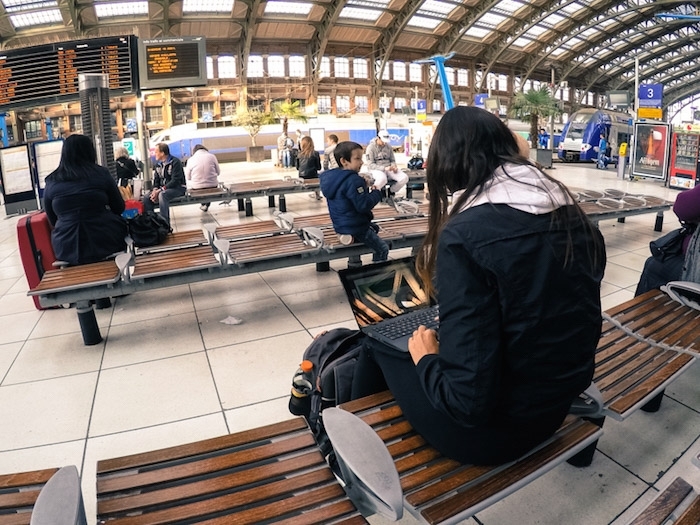 Your information is good for those thinking about traveling by Rail! Thanks for helping out those with a dream to travel by rail. You’re right, it is a fabulous experience coming from someone who grew up there! Good to know that DB has all these facilities, we are planning to travel with Eurail next winter and we´ll be using mostly DB trains. Your comment arrived on the perfect timing. We are super excited to do this next trip, still planning our route, but I know it will be fantastic. Europe in winter time is gorgeous! Hello! Informative article. We bought our Global Passes in April and got a pretty decent price for them (under $700/person). We are looking forward to traveling and seeing Europe by train. We love the idea of being flexible and not having to worry about checking in luggage. We did book one flight (from Prague-Venice) but it was dirt cheap and allowed us more time in Italy. Other than that we plan on taking the train everywhere. I did notice you mentioned Italy and it being difficult traveling by train. Do all the trains there require Reservations? Sure hope not. In Italy you will need reservation for the high-speed trains(freccirossa, freacciaargento, frecciabianca) and for sleepers. We used only regional trains and worked perfectly. hey!! thanks a lot for the information! i will do it for a first time in august! i love to travel and discover new places and people! What do you think is best eurail or interrail pass! ? ? The only difference is that Interrail is for European citizens and Eurail is for non-European citizens. Thanks for stopping by! And we are super happy that our blog has helped you!! Sounds like a great trip all the way to Sri Lanka to Europe!!! Enjoy!! Thank you for the information ? I am from the Philippines and I would like to travel Europe, (go to as many countries, or cities as much as possible) for the first time. I’m a novice when it comes to this kind of things, and I would like to confirm if I still need to book hotels? Or can I just spend nights on the train, traveling, to save money and time? I hope you could enlighten me on this, thank you in advance ? If it’s a short-term travel you could save money on accommodation sleeping some nights on the train or doing Couchsurfing. It’s very informative Nat&Rob.We are planning a trip to Europe but we have a fixed schedule. We want to cover Paris, Amsterdam, Switzerland (Zurich, Lucerne, Bern, Interlaken), Italy (Rome, Pisa, Florence, Venice). We are confused which Eurorail pass would suffice for us, or should we book individual train tickets. We don’t see a combination of the countries that we are planning to visit on the eurorail website. We don’t know if there are general (non-high speed direct) trains to swiss alps etc. What would be your suggestion here? To choose the best pass it will depend on how many days traveling you are planning to have. You wrote 10 cities, so I assume it will be 10 days traveling (you can take as many trains as you want in a day, so connections in the same day count as 1 day of travel). – 4 Countries: (Benelux “Belgium & Netherlands” + France + Switzerland + Italy), with this pass you get 11 travel days for 607 Euros. And you can travel between the 4 countries without a problem. If you have a fixed itinerary, I think this is a good option for you. – Global Pass: you can travel to all 28 European countries and you can choose between 11 or 15 days travelling in a period of 2 months; or 15 / 22 continuous travelling. But these options are more expensive than the Pass for 4 countries. About the trains to the Swiss Alps, they have trains very frequently (high speed and normal ones), depending on the company you get you can use high speed with Eurail pass (with reservation). We crossed part of the Alps with normal trains, the only thing is that depending your destination you might have to change trains on the way. The Glacier Express route is partially covered by the Eurail Pass, part of it you’ll have to pay extra. Thanks and have an awesome trip! Finally with the help of your inputs, I was able to decided on which eurorail tickets to take. We didn’t go for a pass though, because the plan we came up with, there we are using the train only to transit between the major cities. That way, eurorail pass was proving to be more costly than individual tickets. Of course, for that we had to forego the flexibility that comes with the pass. I’m sure it will be an amazing trip!! Enjoy it! If you are traveling during summer, remember to buy your individual train tickets in advance. Some lines get really busy during high season. For a similar trip i got a swiss pass (that was the country i spent most time in ) a two country pass (france and italy) and a cheap flight to amsterdam . This worked really well as i could get the trains to border of Switzerland, change trains with passes to france and italy from various stations. The flight to amsterdam was really cheap for a three day trip, return ticket. As a single traveller worked out really well and got to see so many of the great places without stress of driving and the flexability to walk around and meet fellow travellers without being squashed into a seat next to some one for hours, or as a tour group. Such memories! I went backpacking throughout Europe in 1997 via our EuroRail Pass. What awesome memories! It was such a great trip! I can imagine how amazing it was!! Thanks for stopping by and sharing your memories! Nat, your post is quite informative and helpful. I am on a 10 day trip arriving Paris and departing Rome. I will be staying in Paris for 2-3 days and taking train to Milan and will be in Italy for remainder of the days. Do I take 2 country pass? and does EURAIL pass allow us to take public transportation for free or we have to buy them separately? For sure, the 2 countries pass is the best option for you, as it includes the trains between the two countries and cities. About the local public transportation, it’s not included on the Eurail Pass, you must buy the local metro / bus / train ticket. If you buy the Eurail Pass you get some benefits and discounts on boats, intercities buses and some services in the countries, here are the links to know more about the perks in Italy and France. Hope I manage to answer you doubts, cheers! I wil be traveling to Europe next June for 2 weeks with my adult children and some of my siblings. Can you please give us some advice about the Eurail pass that makes sense for us? We are flying by not Frankfurt, Germany and planning on taking the train to Lublijana, Slovenia and then to Venice and Milan, Italy. We might take a sidetracked to Croatia. What kind of pass should we get? Hi Laura, how are you? For this trip you have two options of Eurail Pass, the 4 Country Select Pass or the Global Pass, and to choose the best one you need to think about the duration o your trip (the number of days you will be using the train pass). If your trip will be less than 8 days (I mean the total of days you will be spending travelling between places and using the pass) the best option is the 4 Country Select Pass, it’s also the cheapest option. However, if you plan to use the trains more than 8 days, than the Eurail Global Pass is the best bet, as it gives you freedom to move around as much as you want. To book the 4 Country Select Pass you need to choose bordering countries, as you said, your itinerary is Germany, Slovenia, Italy and Croatia, so you need to add to this list Austria, the country you will use to cross from Germany to Slovenia and Italy. The good thing is the Slovenia and Croatia count as one destination, so you buy the 4 Country Pass but actually have access to 5 countries. Hope I answered your question, if you have any more doubts let us know. And, when you decided to buy the Eurail Pass, please make your purchase through our links here on the post, you pay the same amount and we got a small commission for helping you plan your trip! Hi Laura, just got back from Europe from a 3 week trip and I will say the Eurail Pass was the smartest thing I did. Fast, cheap and efficient! Good to know you had a great experience! Great tips on the Eurail Global Pass. I didn’t know that’s how it worked. 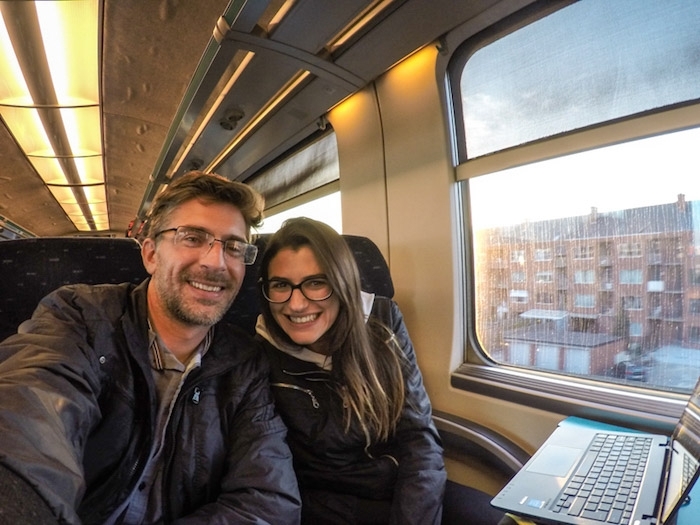 We’ve lived in Europe for 3 years, but never did an extended trip by rail (though we talked about it). We were always unsure if we would enjoy it more and found that we could book flights/car rentals for cheaper or at least close to the same cost. I also had not heard about the additional fees for the high speed trains, but only in certain countries. Those hidden fees, and how the different countries deal with them can definitely be confusing, that’s for sure! Europe by car or train, that’s a big doubt… I would love to do both! Happy Travels to you guys! WOW! What a thorough and thoughtful post. You really provide insight as to the pros and cons of using Eurail. So, while it may not have been the most economical choice for your particular itinerary, sometimes it’s worth paying a little more for convenience and flexibility and (mostly) stress-free travel! And I would have to agree, going by train is the BEST way to see Europe! You are so right Toccara, sometimes is worth to pay a little more to have some convenience, specially if you are doing a long trip. Nothing bits the comfort of a 1st class train that arrives in the heart to the city. I love traveling by train! I consider the journey as part of the fun of the destination. With all the amenities of the Eurail, you can just sit back, relax, and enjoy the scenery. I had no idea that Eurail passes were so flexible. Thanks for the detailed info, this has undoubtedly saved me a lot of time and research for planning any trips to Europe in the future. Thanks for the comment Heather! What I love about Eurail is the flexibility, so if you guys want to have freedom to explore Europe, sure this is the best way! I love travelling by trains whenever I’m in Europe. We also travelled on a Eurail pass for a few weeks in 2009, and were SO impressed by the freedom and flexibility it offered. The opportunity to see so many beautiful views outside of the window, makes it even more memorable too. Travelling by train is soooo good! The journey itself is so pleasant and beautiful!! If you’ve got the time then the train is a great option. I’ve only caught the Eurostar from London to Belgium. Otherwise I just couldn’t afford the additional time. It is much comfier than a plane though! What a wonderful and detailed summary of taking the Europass for train travel around Europe. It sounds like the key to making this work is having a flexible schedule. We’ll be traveling in Europe next year and will certainly look into this further. Nice job with the pros/cons. Cheers! If you are coming to Europe, have a good look at the types of Eurail Passes, depending on where you are going it can be the best option. Specially if you are travelling to countries where the transportation are a bit pricey as Scandinavia or Switzerland. 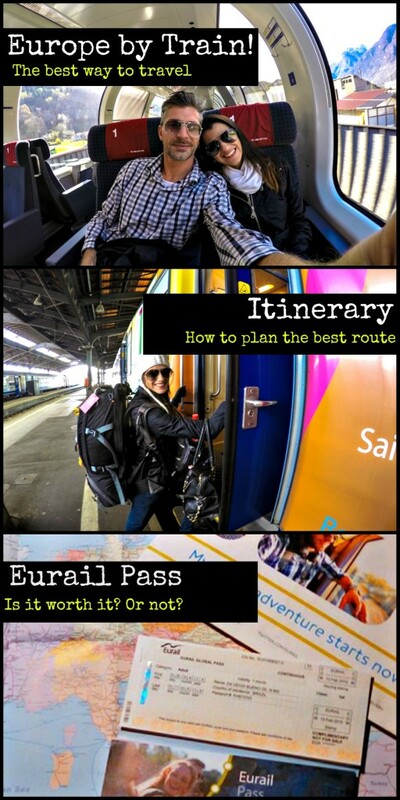 I’ve never tried Eurail and although it seems a bit pricey, I love the flexibility. There are so many places in Europe like Scotland, Norway & Switzerland that I would love to see by train to really soak in the beautiful landscape. I never thought about traveling by train through Europe, but your article made me wish it. It seems pretty simple and flexible, and the best part is the big number of destinations that can be easily reached in this way. The options of cities and destinations are endless when you are travelling by train, espcially if you have a Global Pass where you can just jump on a train and head to a new place. We are in the middle of a 3 months Eurotrip and again using Eurail Pass, so convenient and easy! Train travel is my least favorite mode of transportation. What I don’t like about it is that it’s so easy for anyone to get on, so if you’re traveling by yourself you have to take everything to the tiny little bathroom with you or to the bar car. That’s definitely a pain. I did a Eurail pass mostly traveling in Italy and France and it isn’t easy to use. You have to have reservations in advance and you can only book online if they can send you the tickets to your permanent address. So that means making trips to the train stations to set up tickets, which there aren’t always spots for you on the trains. And those additional booking fees add up! I get your point about safety but thank God nothing ever happened to us, and we do leave our luggage at our seats when going for a walk or to the train restaurant. I’m sad to hear that you didn’t have a good experience with Eurail. About the reservations, Italy and France are the most strict countries for Eurail, but if you don’t use the fast trains most of the time you don’t need a reservation (regional trains are included on the pass and most of time no need reservation 😉 ). What we usually do is to make a reservation (when needed) at the moment we arrive at the destination, so we don’t need to go back to the train station later on. I looked at the website and it seems like there are many different types. My friend said that if its a planned trip, it’s not worth using it but if you plan to back pack then its best to have a eurail pass because trains can be so expensive. The Eurail Passes are useful for both types of trips, planned and expontaneous, the difference is the type of pass you should buy. We are back to Europe, we using the Eurail Pass for 3 months this time, and no doubt it’s the easiest and most flexible way to get around Europe. Finally some helpful information on this Eurail Pass, I was thinking of using one last year but couldn’t really make up my mind as it was too confusing. Tks for the kind words, we just finished another trip using the Eurail Pass, so convenient! I am Albert from the Philippines. I will be in Europe using a continuous 15 day global pass. Do I need to write in my travel diary all my trips like regional trains, S bahns, and other rides included free in the Pass? If I do, I may need 4-5 pages in my 15 days travel. Or just the Long distance travels? Hello! Very interesting article. Thanks for the information. I am traveling to Europe and I was wondering what brand/type of backpack that you have on your back in the picture! Those are form Gelert, I think is a brand from the UK. We wrote an article listing other options of backpacks, you can check it here. Hi Natalie and Robson! I am new to your blog and I was so impressed with the content you put in here. There are so informative and helpful. As for me, I believe eurail pass is the way to go for those who want to tour the great cities of Europe. It’s not just about transportation, the fact that train has been part of Europeans travel, and their way of life, when you’re there, it’s like experiencing how the Europeans spend a fraction of their day already. Not to mention, it’s a lot cheaper as compared to the others method of touring around. Yes, the convenience is the best feature for us.